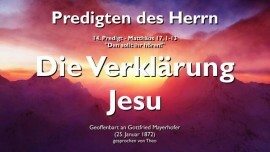 This entry was posted in 53 Predigten von Jesus - 53 Sermons of Jesus and tagged 14. 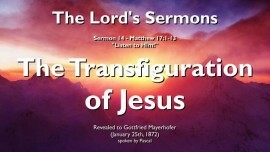 Predigt von Jesus, 14th Sermon of Jesus, Die Verklärung Jesu, Gottfried Mayerhofer, La trasfigurazione di Gesù, Matthäus 17_1-13, Matthew 17_1-13, Predica 14 del Signore Gesù, The Transfiguration of Jesus by jcadmin. Bookmark the permalink.